GPS does not work accurately in Eureka Springs, Arkansas. If you use GPS, chances are you will get lost, or take a very long way around to get where you are going. Or end up on a road that does not exist. We highly recommend using google maps for better accuracy. 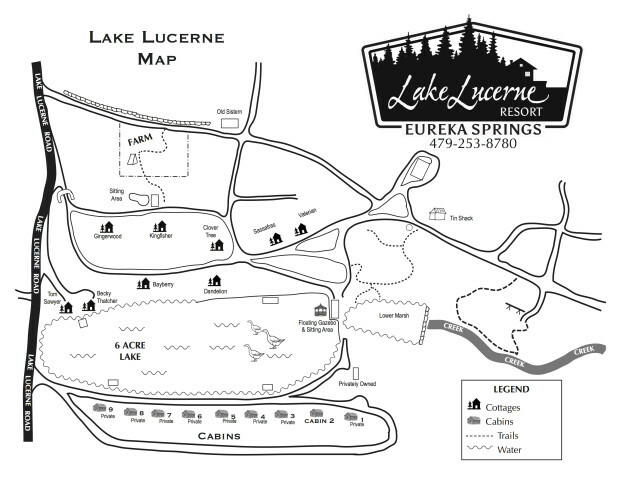 Click the link on the left to download a printable map of Lake Lucerne. Each cottage or cabin has very specific, unique directions. We have three entrances to our Resort property. Our first entrance is the main gateway. To the left as you enter, you will find the Gingerwood, Kingfisher, and Clovertree. Valerian and Sassafras on their own road to the left of Clovertree. If you stay straight through the entrance, you will find the Bayberry and Dandelion Cottages. Tom Sawyer and Becky Thatcher: 30 feet past the main entrance, staying on Lake Lucerne Road, make a left into the next small gravel driveway. Cabin 2: Continue on down Lake Lucerne road, passing the small gravel drive for the Becky Thatcher and Tom Sawyer, take your next possible left, along the lakes edge. Stay straight along the lake’s edge (do not go up the hill). The first cabin is Cabin 9, so count backwards as you pass them. Turn around in front of Cabin 1, and park in front of Cabin 2. Repeat, PARK IN FRONT of the cabin, along the stone wall. Plenty of space. Coming from West or East Hwy 62, take Hwy 23 South at the Land O Nod motel: About 1/8 of a mile, take your NEXT PAVED LEFT at Greenwood Hollow Road. Greenwood Hollow is at the Brydan Suites Motel and Bank of Berryville. Take your NEXT RIGHT onto Lake Lucerne road that is right before the school. Follow the road down a couple of S turns until you come to the entrance of Lake Lucerne Resort. Follow the specific directions on each cabin or cottage page to find yours. As you approach Eureka heading north on Hwy 23: About 1/8 of a mile before Hwy 62, take a RIGHT at Greenwood Hollow Road. Greenwood Hollow is at the Brydan Suites Motel and Bank of Berryville. Take your NEXT RIGHT onto Lake Lucerne road that is right before the school. Follow the road down a couple of S turns until you come to the entrance of Lake Lucerne Resort. Follow the specific directions on each cabin or cottage page to find yours.